What does it take to earn a solid, middle-of-the-road three stars in a book? Basically, it involves a book that is single-minded in its goal while being so badly researched and written that you come away feeling mildly dumber for having read it. 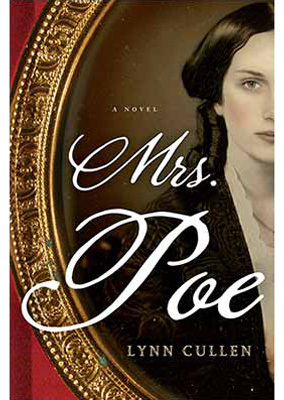 Mrs. Poe is yet another attempt by a historical novelist to paint a picture of what if. And those novels, when done well, are really, really fun. But the difference between supposing and downright muckraking is not usually a fine line to cross. It’s one thing to craft a story on an often-misheld belief that Edgar Allan Poe and Frances Sargent Osgood–a prolific poet and contemporary of his–may have had a fling. But to take it upon herself to build a premise that Osgood went for nearly years at a time without seeing her philandering husband, leaving her to all but beg in the streets for a roof and food, is stretching things. More importantly, let’s suspend belief for a moment and pretend there was actually any truth to not only the absent, neglectful husband idea, but also the Poe-Osgood affair, a theory that Poe scholars have destroyed time and time again. Instead of crafting a story of undeniable, forbidden love, Frances is basically painted as a woman who thinks to herself, “Why not? My husband’s sleeping with every heiress in the country, I can cheat if I want to.” The depiction of any love–heck, any level of fondness even–between Poe and Osgood is so void that I can’t tell if the author subscribes to the scholars’ belief that it never happened, or if she just doesn’t know how to write a good love story. Other details were borderline annoying, like the reference to words and phrases that simply were not in use in Poe’s day. There were details that were fun for a while, like the names of their contemporaries and the story lines associated with them, but with the sheer number of word errors in the book, it’s hard to tell if these story lines were researched at all or merely pulled out of the author’s imagination. Finally, the deranged villain of the book is purportedly Poe’s simple-minded, child-like, tuberculosis-stricken wife, only for us to find out at the end (spoiler alert) that it’s someone equally implausible and insulting. So how does a book with this many problems earn such a high rating? The time line of the book demonstrated that Osgood, who became one of the leading American women writers of her day, at one point struggled with writer’s block and rejection letters. She had to force herself to sit down and put quill to paper to pay the bills, just like writers of today. Moreover, the book was mindless fun. If it had been set in a parallel universe where reality and recorded history didn’t matter, it would have been okay. Think of it as a vapid beach read for intellectuals. Posted on May 18, 2014, in Uncategorized and tagged ebook review, historical fiction, Lynn Cullen, Mrs. Poe. Bookmark the permalink. Leave a comment.